Should I stay or should I go? When you’ve just graduated, the world is your oyster. Many graduates take advantage of this opportunity to contemplate a change of scene. Although the setting for the next chapter of your life is a decision based on personal as much as professional factors, you might like to take into account where employment hotspots are. Employment search engine JobisJob has recently undertaken a study into which cities, of the top ten featured on their pages, advertise the highest quantity of jobs containing the word “graduate”. You might be a little surprised at the results. There is a common preconception that most graduate jobs can be found in London. Whilst there are indeed thousands of opportunities in the capital, it is also worth considering that the population of London (and therefore likely competition for jobs) is huge. In terms of job offers per person, the City actually comes fourth after Cambridge, Bristol and Reading in the JobisJob rankings. A strong reputation for R&D, pharmaceuticals and IT-related industries, as well as a prestigious University makes Cambridge a breeding ground for graduate opportunities. Although London is known for being a focal point for big graduate schemes, a high propensity of SMEs looking for qualified personnel could be what gives the city its edge . As one graduate and current industry professional explains it, “Cambridge is chock-full of scarily competent academics who like to set up companies on the side“. Bristol, second place in the league tables, is a city characterised by innovation and enterprise, so it comes as no surprise that more positions for graduates are advertised here on the JobisJob site than other UK cities. Although Bristol mostly benefits from a developed banking and insurance sector, the city enjoys a very diverse economy , making it a perfect place for graduates of all stripes. A strong city for science graduates to look at is Reading, which (perhaps somewhat unexpectedly) comes in third in the study. Large technology parks and big-name companies such as Microsoft, Oracle and Fujitsu offer a likely explanation for this. Also benefitting from the ING Direct headquarters and a presence from other financial sector graduate employers, Reading would also be a good destination for those with a business degree at the end of the summer. These figures hopefully highlight the value of reading behind the headlines when considering location in your job search. As highlighted above, many regions of the UK are ‘hubs’ for certain sectors so it is worth researching if and what these are for your sector of interest. See our website for up to date labour market information. Results go from Q2, 2012 – Q1, 2013. Total sample size of 17,000,000 job offers. 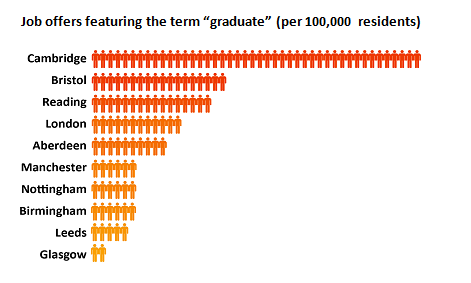 Findings have been based on whether results feature the word “graduate” in the advertised job title. Population sizes have been defined as specified in the UK national census. The ten cities examined are those which have featured most job offers on JobisJob.co.uk over the last year.